Around every 5th child in Salzburg suffers from a psychological illness! Unfortunately, however, it isn’t so easy to get the necessary therapy. Especially in smaller towns where the waiting lists are long and public funding alone are not enough to allow all of the affected children to receive the therapeutic treatment that they need.This is why Wenatex has provided years of commitment toward supporting the Pro Mente association and Kinderseelenhilfe in Salzburg, associations offering psychological aid for children and adolescents. Thanks to the financial support provided by Wenatex, the association was, for instance, able to fund the “Bubble-Truck” in 2010. The “Bubble-Truck” was used by therapists so that they could offer mobile services to children and adolescents in the towns around the province of Salzburg. Wenatex has recently donated another 30,000 Euros to ensure that the psychiatric care services for concerned children in the Salzburg municipalities can be further expanded. LIKE, SHARE, COMMENT = DONATE! With the aid of a donation campaign on the company’s Facebook site, Wenatex not only wanted to provide financial support in December 2013, but also to use this form of social media in order to draw attention to the important work by the Kinderseelenhilfe child-welfare association and to psychological illnesses, which are still pretty much a taboo subject:The appeal to the Facebook community was the following: Like, Share, Comment! 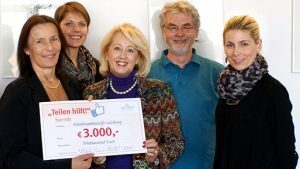 Wenatex donated 1 Euro to the Kinderseelenhilfe association for each Like and each Comment contributed to the donation campaign that was posted on Facebook. 2 Euros landed in the donation pot for each Share of the photo. Thus, a donation sum of 2,304 Euros was collected and was then topped up to 3,000 Euros by Wenatex. 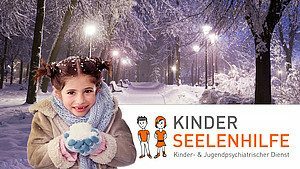 In the week before Christmas, Margit Korn, Managing Director of Pro Mente Salzburg, took great pleasure in accepting the donation for Kinderseelenhilfe at the Wenatex headquarters in Salzburg.